Eric Satie's Gymnopedie Nr. 1 is a beautiful piece for piano. 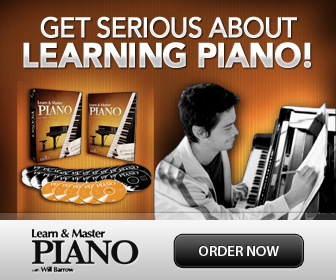 Here you can get free sheet music and tips on how to learn it. 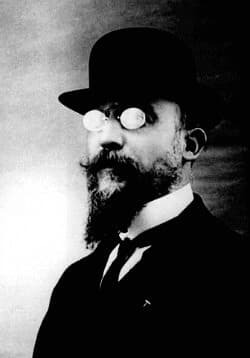 Erik Satie was a French avant-garde pianist and composer who wrote several pieces for piano. Some are a bit quirky and fun, like Sonatine Bureaucratique. Others are timeless and beautiful like the "Gymnopedies" and the "Gnossiennes". One of the most well known pieces for piano is the first of the 3 "Gymnopedies", that you can sometimes hear as background music in movies. The piece is great for an intermediate level student. It is relatively easy since it is so slow, but there are some technical challenges in how to keep the melody flowing and balanced above the repetitive accompaniment. The change of the accompaniment from one hand to the other also needs to be smooth and balanced. Start by learning the accompaniment. In the introduction (first 4 measures), the bass is played by the left hand and the chords are played by the right hand. Practice this until it is even and balanced. Continue learning the left hand, which takes over the accompaniment in measure 5-8. First practice the bass, played with the tip of your 5th finger. Learn to play the chords. Then combine the bass with the chords. Practice the large movement from the bass to the chord by playing very slow, but moving your arm swiftly in between. In measure 9-12 the left hand will play only the bass again as the right hand plays the chords. The right hands melody should be played with a "singing tone". You will play legato and practice playing beautiful and connected phrases. In measure 9-12 you will play the treble F# and then keeping it "ringing" while you play the chords of the accompaniment as in the first measures. You do this by keeping the F# as you change the pedal. In measure 19-21 there is a similar pattern. This time you will keep the E and play the chords "around" it. You need to change the finger while holding it, (see the video at 0:55-1:03). The same techniques are used in measures 48-51 and 58-60. When playing the last chords make sure to relax your arms and shoulders while really stretching the fingers, so that all notes can be heard clearly, but softly and at the same time. In measure 24-26 the large chord played in the left hand is impossible to play for a smaller hand. The top note should then be played softly in your right hand, with the melody. The same can be done in measures 29-31, 63-65 and 68-70.